i like to tell stories : George Carlin. My father called this morning, too early for it to be good news. I only remember him saying, “Did you hear about Carlin?” I hadn’t. George Carlin died yesterday, he was 71 years old. Carlin was a personal hero of mine growing up, I can remember seeing his famous HBO specials even before I really should of been watching. The sharp wit, piercing observations and sarcasm all poured out of the man with a brilliant point of view that seemed so obvious, you wondered why it took Carlin to point it out to you. TIME called and needed him photographed for a 10 Questions article. I set up hours early and waited for him to arrive in the hotel suite. 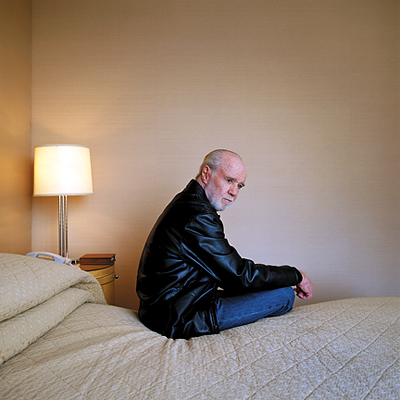 I left the door closed before he arrived, I wanted to see Carlin through the peephole. He was just like you would of expected, only kinder and happier. He went into a rant about hair care products when I asked him to take his hat off, that then descended into a wonderful moment of he and I yelling the F bomb back and forth at each other till I blew the circuits to that half of our hotel room. Thankfully, I had this second shot ready to go, it was a better photograph anyway. I am so happy I blew those circuits or this image never would have happened. It was the best assignment I ever had, it was one of my favorite people and it was one of the happiest days of my life. 630 AM Friday the 13th. Jonathan Saunders is not me. Less then 9 days before my birth.